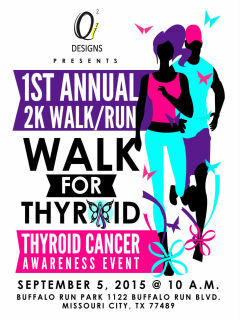 Qi2 Designs presents 2K Walk for Thyroid, a thyroid cancer awareness event that will include group fitness exercises, activities for the youth and information on thyroid diseases and cancers. With this walk our intent is to position the thyroid disease/cancer and its cures within the general population. Individuals are $35; Team Registration (6 people) - $175.